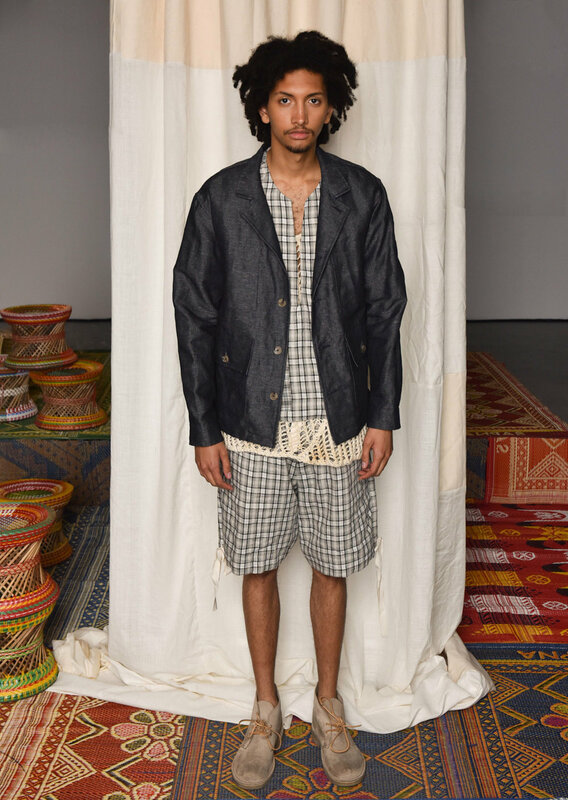 Citing his multicultural roots as the influence behind his fashion, Nicholas Daley made his debut at London Fashion Week Men’s SS18. Bringing together a pastiche of elements into a beautifully crafted presentation, the display was dense with facets that drew the eyes and mind into a twofold process of appreciation. Stood on a platform of Kilim rugs and sound tracked by the music of Nabihan Iqbalaka and Golu Signh Gaba, the environment was saturated in rich colours, textiles, and sounds emblematic of multiculturalism, perfectly setting the scene for a multi-sensory understanding of Daley’s vision. Taking the Madras Check as his starting point, Daley wanted to emphasize how its very nature had been re-appropriated around the world, and through a collaboration with Scottish kilt designers Glenisla, Daley could ensure that his designs were of a desirable quality. 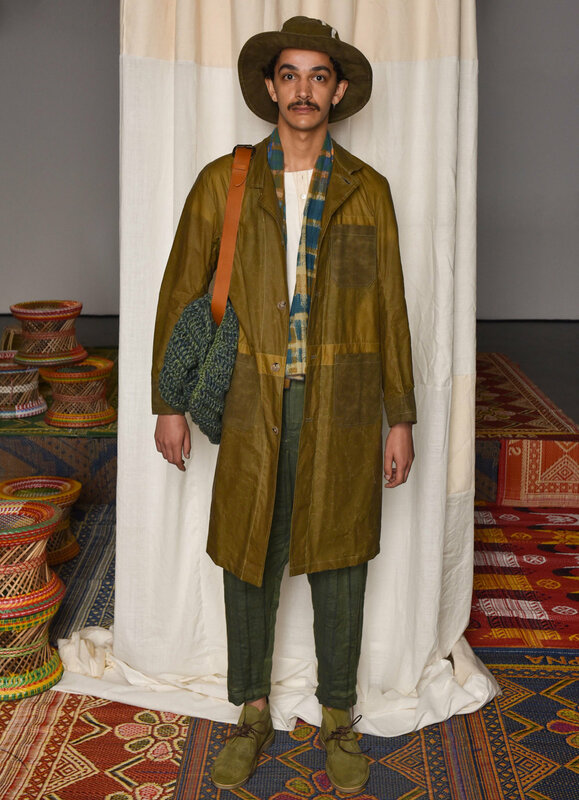 In palettes of sage greens, beiges and creams, these patterns were paired with lightweight linen shirts that shimmered against the neutral surfaces of their counterparts, and camel coloured outerwear, infusing a sense of contemporaneity into the traditional. The collection also evoked laid-back undertones; crisp white wide brimmed hats elicited imagery of lounging in the summer heat, oversized knit bags slouched against the model’s torsos, and chunky knit hats appeared to mirror the iconic beret with the difference of fluidity. 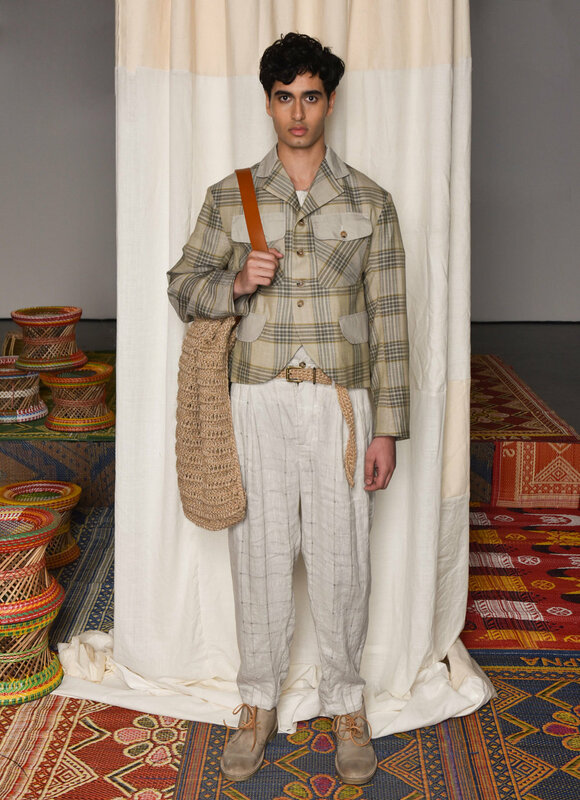 Beginning with the question ‘Who is Sean Flynn?’ Nigel Cabourn SS18 rooted his collection in a military style, creating an anti-war statement with regards to the the war photojournalist’s mysterious disappearance in 1970. In a surge of nylons and enough colours to paint a rainbow, Jasper Conran SS18 toyed with the notion of fashion as a means to simultaneously reveal and conceal, resulting in a number of statement looks.